The tallest building in Bristol is St. Mary Redcliffe, its spire rising 292 feet in the air. The church is set along the harbor and has done so for nearly 800 years. The original construction of the church began in the 1200’s and was finally finished in the 1400’s. Late in the 1400’s the original spire was damaged by a lightning strike and burnt to the ground. It remained like that for another 400 years. The new spire was erected in the 1800’s where it remains today. The church, like the Bristol area, has a long and wonderful history. It was the main place of worship for the seafaring citizens of the area. It is where they prayed for a safe journey and were they gave thanks when they returned. 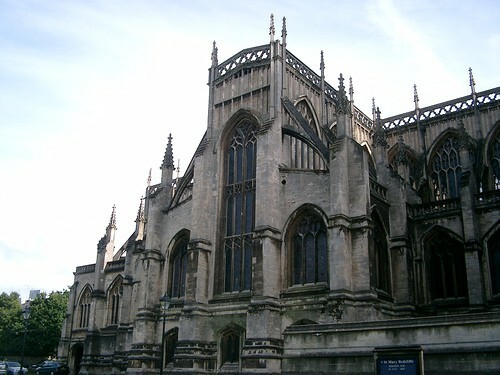 St. Mary Redcliffe has always been exquisite and beautiful, cared for by the townspeople since the beginning. Queen Elizabeth I was even to have said that it was the most beautiful church in England. The church continues to hold services today, but is available during the week for tours to visitors. Some of the stained glass windows still contain the original medieval glass in them; others have been replaced with clear panes. In the back yard. In the courtyard a steel rail is impaled in an odd position. This rail was a piece of flying debris during a bombing raid in WWII. It has been left as a reminder of the war and what it meant as well as a reminder of how close this beautiful church came to being destroyed.